Rotating Coupling Covers (RCCs) enclose shaft flanges on waterborne shafting on aircraft carriers. The existing fairings are doubly curved copper-nickel (Cu-Ni) with tight dimensional tolerances and therefore are difficult and expensive to fabricate. In addition, they have a history of leaking, as evidenced by extensive corrosion of the flanges. Following discussions with PMS 312, NAVSEA 05, and NSWCCD, the RCC concept in this Composites Manufacturing Technology Center (CMTC) project is a hybrid metallic/composite construction. The functions, shape, and arrangement of the individual components are to be determined during execution of the project, based on optimizing manufacturing processes, while reducing costs. As the primary structure the composite shells of the RCCs will be fabricated using methods developed for the fairwaters and rope guards, specifically male molding with OVB prepreg. A decoupled design is desired to eliminate the need for a watertight fairing seal. The principal benefit of this project will be life-cycle savings while reducing acquisition costs or remaining cost- neutral. The project is estimated to save $37M in total, resulting in an ROI of 25:1. The fabrication approach will save production time and, while the RCC is not on the critical path, any production time savings will be a risk reduction. This project will be demonstrated with PMS 312C funding on the earliest availability of a CVN 68 Class carrier. A RCC will be installed and checked after a limited time at sea. If successful, the composite RCC will be approved for use on all back-fits and future construction. The technical community will also leverage this preservation system to all surface ships, increasing the overall payoff for this effort. Implementation is estimated for FY17. project is to develop an updated 11-Round Guide design incorporating current state-of-the-art composite materials technology in order to achieve a more cost-effective and lighter weight SeaRAM 11-Round Guide. An acquisition cost savings target of 50 percent has been established by PEO-IWS Close in Weapons System (CIWS) Program Office. Appropriate consideration will be given throughout the project to ensure that the lessons learned on the 11-Round Guide housing will be directly applicable to the 21-Round Guide. Phase 1 gathered the existing requirements and Technical Data Package, conducted a manufacturing trade study and evolved and down selected to one conceptual design for the 11-Round Guide housing that is lower in cost and lighter in weight. Phase 1 culminated in a Preliminary Design Review that also served as the gate for Phase 2. Phase 2 consists of Manufacturing Risk Reduction Testing, Final Design and Tooling Design. Phase 2 will complete upon successfully passing a Critical Design Review. Finally, Phase 3 will consist of building 3 SeaRAM 11-Round Guides and using those guides to execute the qualification test plan. Based on cost estimates to date, this project will lower the unit cost of the 11-Round Guide housing by at least $800K and as much as $1,200K while reducing the weight by 10-25 percent. Additional benefits to be realized include: (1) a parts count reduction, (2) lower maintenance cost through a reduction in aluminum parts and (3) an improvement to the permeability characteristics of the guide. Improvements to the 11-Round Guide will be applicable to the 21-Round Guide as well. This project is anticipated to occur over three phases. Phase 2 commenced upon successful completion of the Preliminary Design Review in Phase 1. Phase 2 includes the Risk Reduction Testing, Final Design, Tooling Design, Tooling Fabrication and the Critical Design Review. Phase 3 includes the fabrication of three complete guides, all qualification testing and will culminate in a Production Readiness Review. Phase 3 of this project is expected to complete in time for a 2017 implementation. Composite structures are often made of sandwich construction composed of a core and two face sheets. The traditional phenol processing approach results in laminates with excessive voids and reduced mechanical properties. Additionally, a robust FSTsafe (fire, shock, and toxicity) core material for submarines does not exist and must be developed using materials that are already commercially available. The objective of this phased Navy ManTech Composites Manufacturing Technology Center (CMTC) effort in support of the VIRGINIA Class submarine (VCS) is to improve and demonstrate the manufacturability of an internal submarine article using the FST-safe resins. Some existing systems have been approved for use within the pressure hull of a submarine but the systems frequently have too many voids to be reliable. This project will identify improved manufacturing processes to reduce the phenolic void content and improve the design allowable. 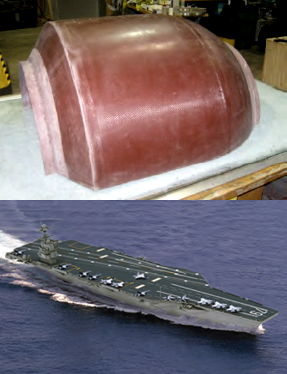 The second purpose of this effort is to identify novel commercially available materials and approaches to bring composite within the pressure hull affordably. Both the new processes and new materials will be screened using a cone calorimeter and then demonstrated on a doubly curved article. Mechanical properties will be generated to replace the outdated design information based on the legacy phenolic resin process. The result of this effort will be the processes, methodologies, and materials to be used to bring composites within the pressure hull. Those subsequent applications will allow for the removal of metal components in highly corrosive environments therefore reducing the life-cycle costs of the submarines. The manufacturing improvements made to phenolic core systems and phenolic laminates can be leveraged to applications industry wide and provide far-reaching improvements to multiple DOD platforms. This project will transition to a follow-on project for point insertion. This follow-on effort will be S2679 Fire Safe Resins Phase 2 and is currently pending. Implementation will occur at General Dynamics Electric Boat (GDEB) with an anticipated date of 2019 on SSN 794. Initial work has been completed to develop implementation targets for the follow-on phase. A production vendor will be sought to demonstrate the techniques developed by the team in a production environment. Like other programs in the Department of Defense (DOD), the VIRGINIA Class submarine (VCS) program and the OHIO Replacement (OR) Class submarine program face substantial financial challenges due to the current fiscal environment. OR is additionally challenged because of considerable procurement cost for the lead ship and target costs for ships 2-12 of the class. Reaching the target procurement costs for the OR platform are only attainable through cost-effective designs that save money over the entire life of the submarine and manufacturing approaches that reduce acquisition costs. The objective of this project was to develop and validate repeatable manufacturing approaches, and their associated cost and weight impacts, for submarine applications. This project used a systems-engineering approach to determine groups of components with similar requirements that can then be mapped to enabling technologies and/or combination of technologies. Enabling technology and manufacturing approaches to be considered under this effort included: out-of-autoclave (OOA) processing to enable efficient use of carbon fiber; multi-material (glass/carbon hybrid) solutions for cost / weight reduction; integrated manufacturing of structural-acoustic windows; integrated manufacturing of laminates with structural damping treatments; and integrated manufacturing of laminates with polymer coatings. Significant cost and weight has been removed from both platforms by replacing conventional metallic and/or traditional GRP components with state-of-the-art composite structure. While innovative composite materials and the integrated manufacturing opportunities that they afford offer cost / weight reduction opportunity, a platform-wide analysis of the systems / components that can benefit from these technologies is required in order to define the technology / combination of technologies that result in the largest payoff. Understanding the technical and cost relationships between innovative composites and the spectrum of components that they can improve provides alternative design and manufacturing approaches for groups / families of components currently manufactured using GRP or steel on a broader level. This approach affords a comprehensive impact to cost /weight reduction initiatives compared to historical single component analysis. The deliverables developed because of this effort provide a valuable data attribute to be used by both the government and General Dynamics Electric Boat (GDEB) for performing design trades and component pricing estimates. The techniques and processes developed in this project were leveraged to composites currently on the submarine and to future efforts. This project demonstrated a production ready composite article that could transition at the end of this Manufacturing Science and Technology effort. Implementation is planned to occur with SSN 792 first. The objective of this effort is to further refine and develop gateway technologies, techniques, and processes and demonstrate that cost-effective design and manufacturing solutions are achievable with acceptable risk for faired structures fabricated from composite and/or hybrid material systems. This task addresses high priority defense and Navy needs, attacks pervasive manufacturing issues, and addresses manufacturing technology beyond the normal risk of industry. Several innovative technologies used either individually or in conjunction with one another, are under consideration for use in VIRGINIA Payload Module (VPN) configurations. Each would employ the use of enhanced composite materials with integrated stiffness and damping, or a combination thereof, to form the fairings that make up the boundary of the VPM. Active Office of Naval Research development efforts are being leveraged in support of this ManTech project. Successful incorporation of the above technologies into the VPM design has the potential to provide significant acquisition and life-cycle savings to the VIRGINIA Class submarine (VCS) platform for Block V and following ships. Acquisitions savings have been estimated to be between $4 and $12M and life-cycle savings for all of the options included have been identified to be between $18.9M and $20.7M, depending on the options selected during the initial down-select. These values include the incorporation of composite fairings in conjunction with the hybrid fore / aft fairings. They also assume incorporation of these concepts in each of the 20 hulls remaining in the VIRGINIA Class starting with the SSN 802. The component down-selection phase of this project is expected to be complete in 2016 to support VPM arrangement design schedules. Technology development was pursued during the initial six months of this effort and will entail four tasks that address requirements definition, material, and construction options, attachments and interfaces, and inspection and repair solutions. The fabrication of full-scale prototype(s) will be completed by fall of 2016. Over the subsequent months, technology demonstration will consist of two tasks that will identify critical aspects of the proposed solutions from Segment I as well as the development and manufacture of full-scale prototype(s). After successful completion of the project, technology will be incorporated into the design of the VCS VPM. It is expected that it will also facilitate consideration for similar technology insertion into OR Class components and structures of comparable design/function. Implementation targets are SSN 802 and VCS Block V.
The objective of this effort is to develop an automated manufacturing technique for large and/or complexly configured tiles, thus reducing cycle time and improving manufacturing rate and response time to tile design and formulation changes. A second benefit is the insight to be gained from this technology and its potential use to apply the existing treatment directly to the hull, thus superseding the molding process. This project could lead to a follow-on task to improve SHT installation efficiency of the material currently molded on the hull. This effort would be applicable to new SHT configurations on Block V, back-fit on VIRGINIA Class submarines, and potentially applicable to OHIO Replacement (OR). The main benefit of Phase 1 is the ability to manufacture large and/or complexly configured tiles using existing treatment material formulations. This would permit the lateral development of spray application techniques to replace existing techniques and facilitate on-hull additive manufacturing and enable the exploration of additional formulations for future development. Completion of Phase 2 will lead directly to manufacturing of complex tiles. The completion of both phases would amount to an estimated cost savings of $1M per ship. This assumes a shipset of approximately 550 large tiles intended to replace roughly 25% of existing hull treatment. Automation of the manufacturing process will reduce the size of the crew as well as eliminate the need for large scale ovens and precise metal molds. Specialty shapes could be programmed, which would result in minimal trimming of tiles, eliminate the need to cut specific shapes from slab stock, and reduce both labor and material waste. Automation will also reduce the cycle time per tile, which is heavily dependent upon assembly, disassembly, and reassembly of tooling. The automated process would not require tooling changes, and would depend solely on the rate at which material could be deposited and the tile built up. This could reduce the process from 4 days to as short as 24 hours. In the event that only Phase 1 is completed, savings would not be associated with replacing an existing VCS trowel application with a spray application. Benefits include improved process control, less rework, improved reliability, and a greater degree of design flexibility. Potential cost savings for this application is estimated to be $100K per ship. The implementation of this effort will occur in two phases over 5 years and will be composed of two principal efforts, development of the material processing parameters and integrating those with an optimized automated methodology. This project will end with a direct transition to Phase 2 to develop a full scale manufacturing demonstrator. Complex shaped and contoured F-35 Joint Strike Fighter (JSF) doors and panels tend to require a larger number of boot details to properly conform to the part. Prior to the installation of the boots, the doors and panels must first be prepared for fastener hole location and drilling where the boots are to be installed. The objective of this Composites Manufacturing Technology Center (CMTC) project was threefold: (1) develop technologies to reduce boot details required per door / panel; (2) develop an Ultrasonic Boot Hole Cutting (UBHC) device; and (3) develop an improved boot adhesive system. Significant cost reduction for fabricating and installing boots on F-35 doors and panels has been a payoff resulting from this effort. Estimated cost savings is expected to be $187M for all aircraft. The cost savings will largely be the result of reducing the labor associated with fabricating boots, applying and cleaning up the boot adhesive, and cutting holes in the boots once installed. A successfully demonstrated development effort will be implemented through the F-35 Affordability and/or the Change Request process. The project will return to the Affordability Initiative Review Board for evaluation and implementation funding approval. The project team will submit an add-on effort to finalize the adhesive portions of the project that were unknown at the start of the effort. The project technology is expected to implement in 2016. The goal of this project was to develop a non-contact laser measurement device for measurement of surface feature flushness on the aircraft production floor. The first step consisted of developing a full set of requirements for a production device. Those requirements were then used to establish initial system parameters and component selection. Module level testing was used to verify that the components selected and the initial algorithms met the requirements set forth. Upon successful completion of module level testing, the full system was developed and tested. Testing of the full-scale system initially consisted of lab scale use and culminated in testing on the aircraft production floor. The final task consisted of manufacturing analysis and planning for the handheld scanner. The system was designed to measure the specific surface feature relative to the profile of the outer skin of the aircraft. This system improves upon current surface measurement processes in terms of measurement quality and measurement time. Previously, only a couple of points on the surface feature were measured, while this system provides the capability to measure the entire surface of the feature of interest. Additionally, the previous system was highly dependent upon operator skill whereas this new system fully characterizes the surface feature without dependence on operator skill, producing a more accurate and repeatable measurement. Upon full implementation, this technology is estimated to result in a total cost savings of over $13M. Finally, the technology developed on this program can be transitioned to other measurement applications providing for an additional estimated cost savings of $13.2M. The necessary steps were taken to ensure that a low-cost method of surface feature measurement was demonstrated that met the requirements of the program and was safe for operator use. A fully functional measurement hand tool was built and proven on production-equivalent aircraft parts. In addition, the cost benefits of adopting the technology on the production floor were quantified via (1) a refined estimate of inspection time and cost savings per aircraft, (2) pricing analysis for the FMT, and (3) evaluation of additional benefits provided by the technology. Implementation is expected late FY16. Fighter jet wing and nacelle skins are complex layups produced from carbon bismaleimide prepreg material using the fiber placement process. Highly tailored layups resulting in numerous steep contour changes have resulted in a defect condition called Out of Contour Waviness (OCW). OCW results in costly Material Review Board (MRB) activity and significant effort has gone into determining the root cause of OCW without success. To date, no root cause of OCW has been determined. This Composites Manufacturing Technology Center (CMTC) project will collect the thousands of data points available from each part fabrication and apply pattern recognition and Bayesian methods to identify and understand the variables that effect OCW. Variables identified from this early analysis will then be used to develop a design of experiment (DOE) in which numerous panels will be fabricated and inspected for OCW. Data gathered from this first DOE will then be used to shape a follow-on DOE if it is deemed necessary. The payoff will be identification of variables that contribute to OCW in wing skins and nacelles. If the identification of variables is successful and OCW can be eliminated without impact to production costs, the cost savings for the F-35 Joint Strike Fighter (JSF) program could be as high as $24M. The cost savings is a combination of reduced MRB activity and the elimination of costly steps taken to mitigate the number of OCW occurrences on current production parts. The implementation of the OCW solution on existing parts could take one of several different paths depending upon the root cause of OCW. One of the easier paths to transition would consist of the identification of a series of process variables that needed to be controlled more tightly but within the current process specification. The level of approval required for this type of change would be minimal though the cost to implement would be highly dependent upon the identified variables. One of the more difficult transition paths would consist of specific design features contributing to OCW. The cost of making design changes in a mature product would most likely outweigh the benefits from the elimination of OCW. Future programs in the design change would still benefit from the results of this project. The implementation is targeted for LRIP 10 in 2017. Known automated mixing systems require extensive mixing process development, engineering, testing, and validation in order to meet the stringent material processing and performance requirements for the F-35 Joint Strike Fighter (JSF) materials. The objective of this project is to develop and demonstrate mixing processes utilizing commercially available automated mixing systems to provide more uniform and consistent mixing of filled polymeric materials and to reduce the overall labor associated with the mixing process. Automated mixing of the F-35 material reduces hand-mixing costs associated with the actual labor time to retrieve materials and prepare them for use on the assembly line. Automated mixing also provides a more consistent product improving first-time yield by reducing non-conformance repair activity labor and material. An estimated $34.2M program cost savings is expected to result from this project over the life of the F-35 program. Technology developed by Applied Research Laboratory of Penn State will be evaluated within this ManTech project. Upon successful demonstration of the technology, implementation will be reviewed and funded through the F-35 Blueprint for Affordability program. Implementation costs are expected to be low and implementation is anticipated for 2017. This project is a joint COE effort between Composites Manufacturing Technology Center (CMTC) and Institute for Manufacturing and Sustainment Technologies (iMAST – Applied Research Laboratory of Penn State).